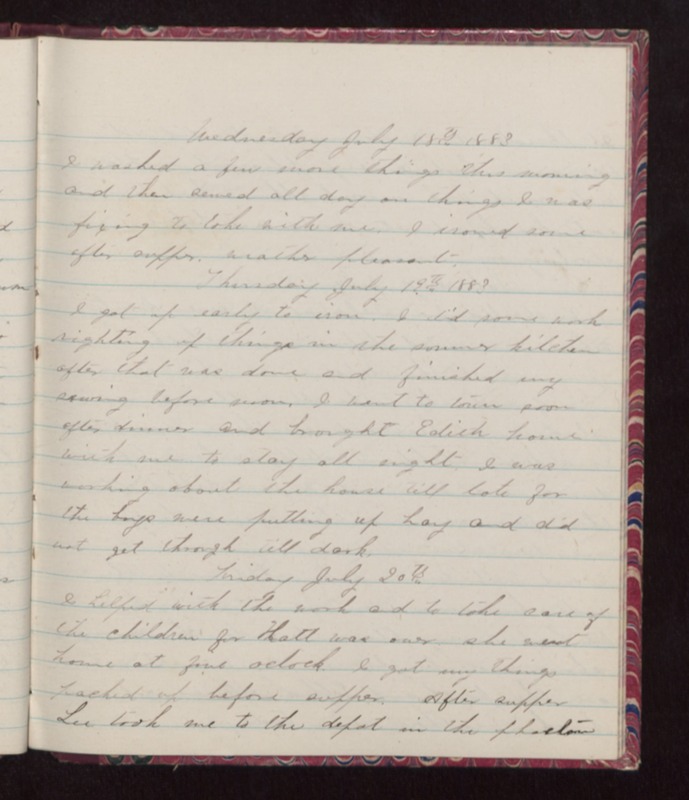 Wednesday July 18th 1883 I washed a few more things this morning and then sewed all day on things I was fixing to take with me. I ironed some after supper. Weather pleasant. Thursday July 19th 1883 I got up early to iron. I did some work righting up things in the summer kitchen after that was done and finished my sewing before noon. I went to town soon after dinner and brought Edith home with me to stay all night. I was working about the house till late for the boys were putting up hay and did not get through till dark. Friday July 20th I helped with the work and to take care of the children for Hatt was over she went home at five oclock. I got my things packed up before supper. After supper Lee took me to the depot in the phaeton.